I love Halloween! 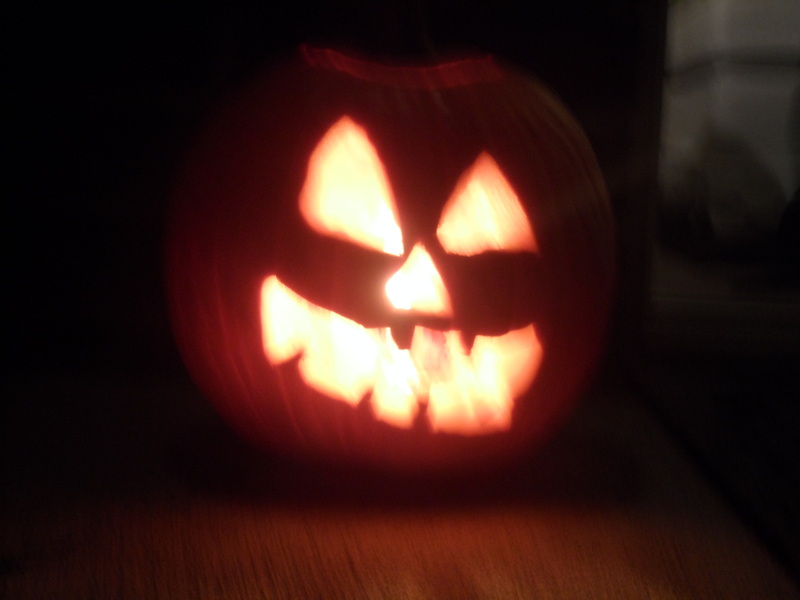 And this year, Giuseppe really got in the spirit, eating yummy Halloween treats and candy; he even carved a spoooooky pumpkin for our front door. This year we had a Greek Halloween. 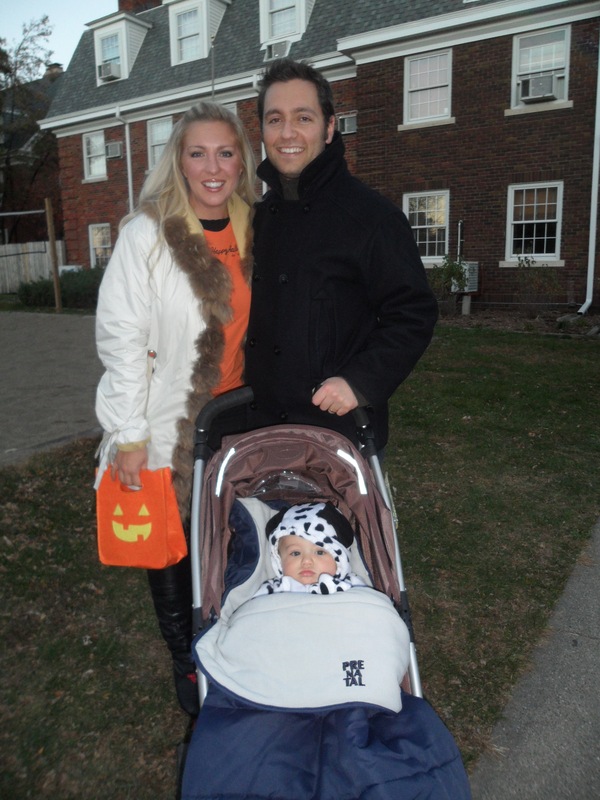 We took Paolo trick-or-treating on Greek row. At Iowa State, all the fraternities and sororities decorate their houses, dress up, and pass out candy to the local the children. It was actually pretty fun. 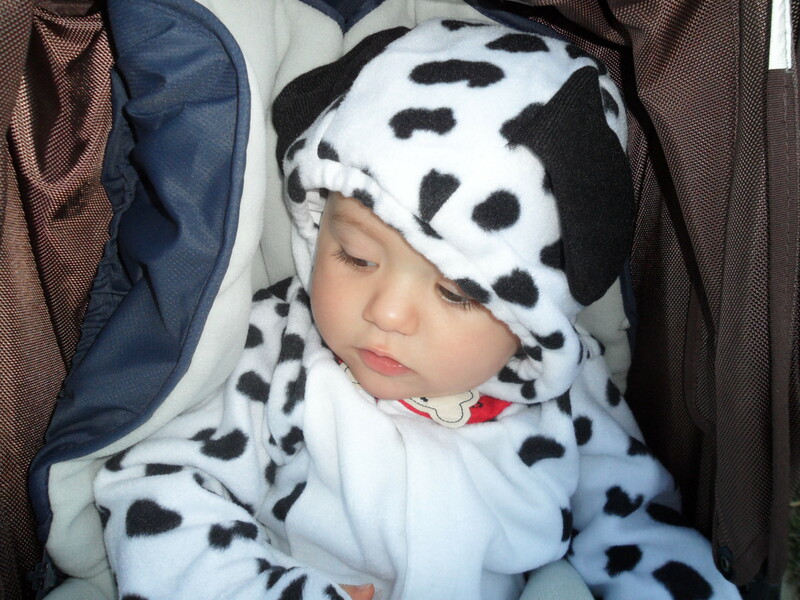 Here are few photos from our trick-or-treating this year. 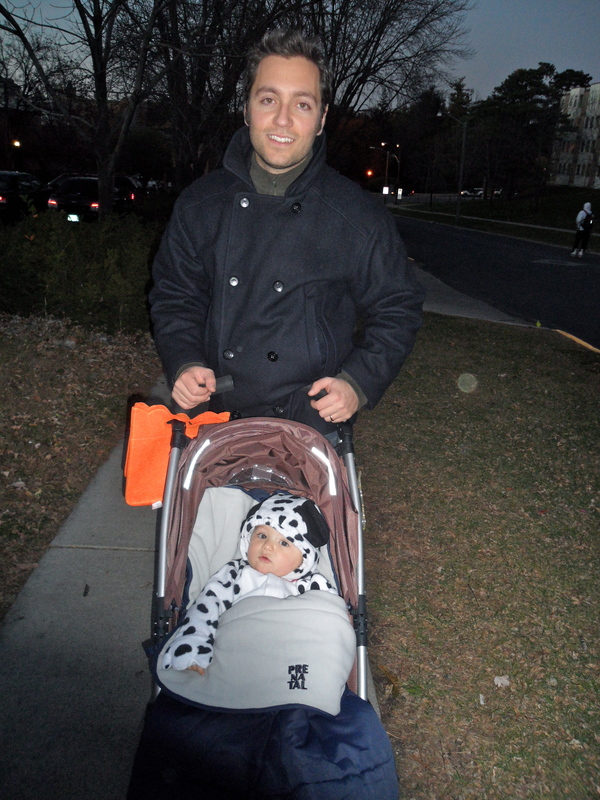 Note Paolo’s ‘stroller sleeping bag,’ which was a definite must in the chilly autumn weather. 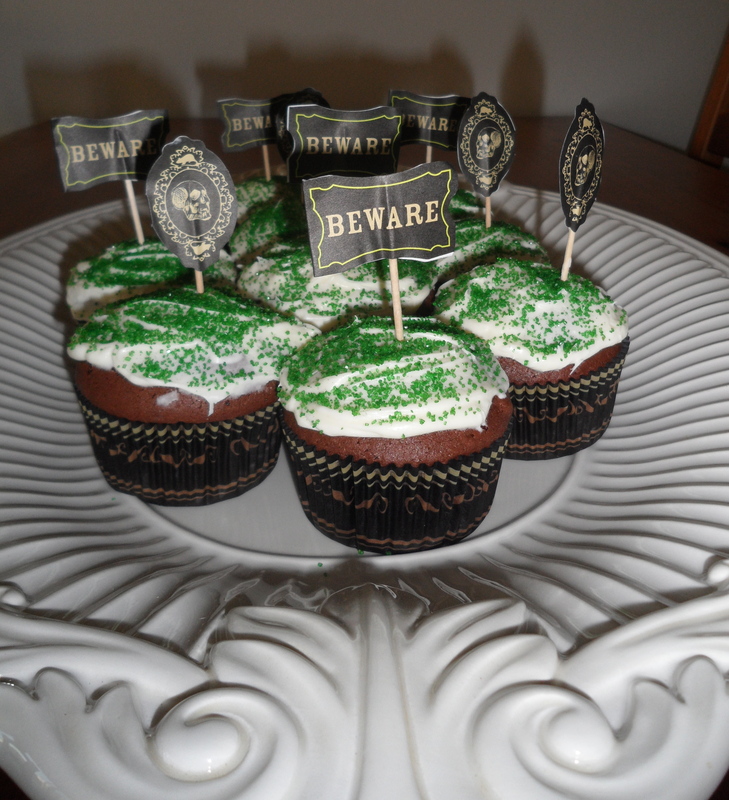 Happy Halloween from la famiglia Dell’Anna! Today is our last day in California. When we made the move here from Italy, I had not really planned on moving away, especially this quickly. And especially to the Midwest. This move has been incredibly sudden, which has made it a bit more stressful that I had hoped it would be. The past week has been a whirlwind of frantic activity, with ending my job, moving our household goods, and just basically taking care of business and tying up loose ends. Giuseppe has been great, running endless errands to get everything squared away. After the movers came and went on Monday, we drove out to Huntington Beach to stay until Thursday. I have had a few “California” days, strolling through Huntington with friends and family, going out on the pier, taking a quick shopping trip/visit to the Easter Bunny at South Coast Plaza. It feels surreal to be leaving; I can’t really wrap my head around how quickly it is happening. It has been very nice staying here, and I do not feel totally ready to leave. But tomorrow it is. We are first driving down to San Diego to visit Zack and have brunch. Then we will drive out to Arizona, where we will visit the Grand Canyon. Giuseppe is pretty excited to see it, and I am very glad to be revisiting. I think it has been about 15 years since I was out there as a child. The next stop will be Santa Fe, then Denver, Omaha, and finally Ames. This road trip should actually be very beautiful and great time for us as a family. We don’t really plan to drive more than 7 or so hours per day, and do plan to take longish breaks to let the baby stretch out and play. Here’s to our new adventure. After about a year of blogging, I can no longer resist. Giuseppe says the funniest things in English. I’ve promised him that I wouldn’t publish any of these comic gems, but I just can’t hold it in anymore. Sorry, love. This little nugget of lingual delight erupted yesterday while Giuseppe was driving me to work; we were discussing the particulars of his year at IOWA State University. (I have decided that Iowa deserves to be capitalized ALL THE TIME.) Our bank needed to call the university to make sure everything was in order. 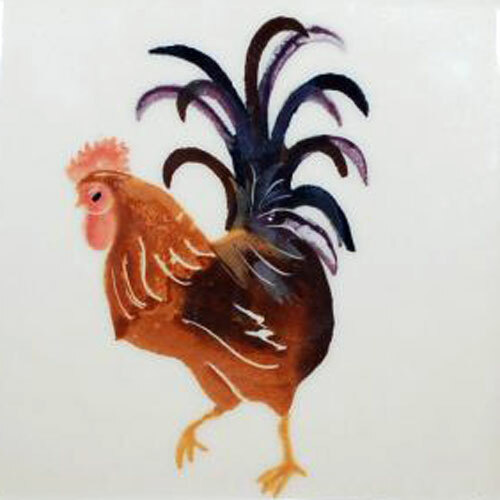 Giuseppe was worried that there was miscommunication between the institutions, hence the Rooster questions. Friday is my last day of work at the office. Next Thursday, our road trip out to Iowa begins. And I will be a Stay At Home Mom, at least for a while. I never really imagined myself as a SAHM. I worked all through college; I taught elementary school while I worked toward my graduate degree. I feel like I have been preparing for a professional career my whole life and now, at 26, I will be staying home with my little guy. Giuseppe and I made this decision when he decided to attend the licensing program in Iowa. We looked into the available salaries and cost of childcare and found that it would be best for our family if I stayed home with Paolo and looked for part-time, work-from-home opportunities as opposed to a full-time office job. I will have to be creative with the work-from-home part. I have been looking into online teaching programs, translation opportunities, tutoring, and things of the sort. While it is hard to imagine my self as a SAHM, in some ways it seems too good to be true. I can raise Paolo without having to hire a nanny or drop him off at daycare, something that makes me quite happy. I know that this will come with its own set of challenges – like keeping my sanity, retaining my ability to carry adult conversations, and, of course, managing a significantly tighter budget – but it is a new chapter in our lives, and I will embrace it. It is, after all, a new adventure for us. On Wednesday afternoon, I caught a flight with the baby from Orange County, California to Des Moines, Iowa. The trip is a “house-hunting” adventure, as Giuseppe’s post-doctoral licensing program begins in Ames next month at Iowa State University. Let me say that again: We are moving to Iowa. Where it’s cold, it snows, and there is no ocean. Did I mention it snows? But I digress. I left the OC feeling relaxed and confident. I have an easy baby: he likes to snuggle, rarely cries, and generally smiles a lot. I boarded the plane prepared. I had my awesome diaper bag packed with the essentials: Paolo’s favorite Giraffe, some teething rings and toys, change of clothes, diapers, and a box of wipes. I was wearing yoga clothes and had Paolo dressed equally comfortably. He’s happy as can be, sitting in his front carrier, looking around. I find our seats on the super-packed airplane. (Not a spare seat to be found.) I am sandwiched in between two grown men, with Paolo, my giant baby, sitting on my lap. Then it began. It started as a fussy whimper. It quickly erupted to a full blown temper tantrum/meltdown. Paolo turned bright red, opened his mouth and commenced to SCREAM at the TOP OF HIS LUNGS. He arched out of my arms and stiffened his entire body. And stayed like that. For a full hour. So my five-month-old is basically standing on my lap pitching the largest fit of his life. On a crowded airplane. Between two men. Before the plane even took off. I tried nursing. I tried massaging his gums. I tried laying him down in my arms. I tried singing. I checked his diaper. And then I started crying. I mean crying; tears streaming down my face and getting my shirt all wet. All while Paolo SCREAMED BLOODY MURDER. This was nothing like our trip to Hawaii when he was six weeks old. Then he just nursed and slept. This was completely different. So there I was crying, with a screaming infant in my lap, on a crowded airplane. The man sitting to my right patted my arm and whispered, “It’s okay, just breathe. He’ll calm down.” And that random act of kindness almost made me cry more, I was so touched. I was sure everyone was ready to kick us right off that plane, and this nice man was being so sweet. After about five minutes of my tears, I calmed myself and pulled it together. But Paolo did not. He kept right on screaming, through my rotations of soothing attempts. Nursing, gum massage, belly rub, change positions, repeat. Nothing. Finally, the same man leaned over and asked if he could hold the baby for a few minutes. I, of course, was very grateful. He took the baby and laid Paolo on his back, on his lap, and rubbed his belly. Paolo continued to scream for five minutes, and then MAGICALLY dozed off to sleep. I am sure the entire plane was grateful. It was a miracle. I felt like the luckiest woman in the world to have this kind stranger sitting next to me on that overcrowded plane. The entire event flabbergasted me. What in the world happened? Looking back, I think the meltdown was a direct result of Paolo wanting to take a nap, but was unable to get comfortable. And I have been spoiled by a child who does not really scream; I was distraught that I could not calm him down. It was the most awful feeling as a mother. For the second leg of the trip, he returned to his happy self, and smiled until he dozed off in my arms, only to wake as we landed in Des Moines. I know the airlines allow passengers to take a child under two years of age to travel on their lap for all domestic flights, but I am beginning to seriously doubt this policy. Paolo is getting too big at five months to sleep comfortably in my arms; I can’t imagine an 18-month old trying to do so. I fly back to the OC tomorrow afternoon, and I am praying that it goes well. Lesson learned: spend the extra money to buy the baby a seat and bring the car seat for naps. Let’s hope the airplane ride home does not involve screaming babies and crying mothers. If it does, I pray for a kind stranger to sit next me.